Marginal Enrollment Cost and Break-even Analysis are two of the hardest concepts to both calculate and analyse as you need to have a detailed and robust cost model to support your decision-making process. Among other things, you need to be able to differentiate direct costs from support costs, and fixed from variable costs, at the course/subject level. However, a deeper look into these courses is required. Instead of just looking at the margin, both revenue and expense should be analysed separately. The following chart plots revenue and direct teaching cost as functions of EFTSL. This will give you the revenue per EFTSL ($35,588) and the fixed and variable components of direct expenses – $24,926 fixed and $11,814 per EFTSL variable, summarized below with total contributing overhead to the school. So let’s cut to the chase – what does this mean? The following table summarizes the break-even point for both Gross Margin and Net Margin. The fully burdened (“net margin”) break-even point is approximately 2.5 EFTSL, so you need an average of 2.52 EFTSL in these courses to fully cover all of your costs, including the university overhead. However, you are covering your direct (school) costs at only 1.05 EFTSL. Therefore, courses below 1.05 EFTSL should be seriously reviewed as they aren’t even covering the cost to teach them. But courses with between 1.05 EFTSL and 2.52 EFTSL are covering their direct costs AND contributing towards the nearly $2million of university overheads that this school consumes. So what happens if you cease to teach any of these courses? 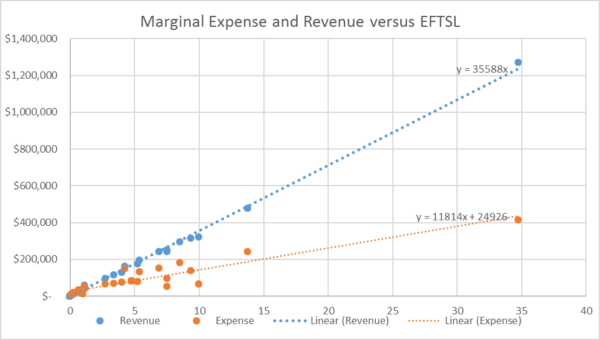 You save on your marginal costs, but your fixed overheads remain the same and just get spread out over fewer courses (causing each of them to individually need more EFTSL to break-even), leading to a loss in revenue that is greater than what you save in expenses. So be aware! A course that appears to be losing money can still be covering its direct costs and contributing towards some of the overheads (just not all of them). Removing these courses without fully understanding their contribution to the overall school bottom line can be very dangerous…you could easily end up in a worse position! * The EFTSL amounts are rounded for presentation purposes. If you wish to do your own calculations simply divide the Total Revenue by Revenue Line Estimate per EFTSL ($35,588) to get the full EFTSL break-even amount.